21st century films and games deserve a 21st century viewing environment. Packard Bell monitors perfectly complement the new Packard Bell desktops and notebooks, matching excellent performance with great style. These monitors show off contemporary thin and sleek designs that look gorgeous in any setting. Select models feature seamless, edge-to-edge high-gloss displays. The Maestro line sports an exclusive design with high-end features, whereas the Viseo line offers cost-effective displays without compromising image quality. Our displays are also environmentally friendly. Their mercury-free LED panels use 68% less power than traditional CCFL panels, ensuring reduced pollution and lower bills. They also meet stringent ENERGY STAR® 5.0 power-saving standards. 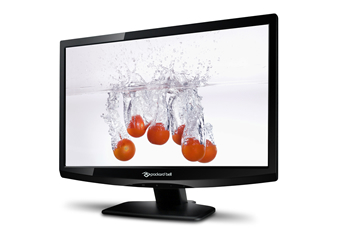 Details are clearer and colors are more brilliant on Packard Bell monitors! High brightness and dynamic contrast, a true 16:9 widescreen aspect ratio, and Full HD resolution on select models deliver brilliant image quality for maximum enjoyment of games and movies. 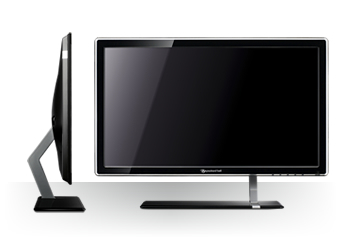 Multiple ports make it easy to connect a PC, game console, DVD player, and other devices to Packard Bell monitors. Select models offer HDMI® and DVI ports so you can extend your viewing pleasure to big-screen HD sources; and enjoy awesome audio as it flows through the built-in stereo speakers.